Three months ago I finally got a reservation for Heston Blumenthal’s 3 Michelin star restaurant ‘The Fat Duck’. A whole 6 years after first deciding to go. Now, it is a very hard place to get a reservation but I can’t claim that’s the reason it took so long, it’s a very long story involving fussy friends, redundancy and child birth amongst other things which I won’t bore you with now. These past three months have gone VERY slowly and I thought the day would never come but last week it finally did! We started by over eating during lunch at Tom Kerridge’s Hand & Flowers in Marlow and were still worryingly full an hour before we were due at The Fat Duck. Luckily a couple of pints and a mulled cider in Heston’s pub The Hinds Head worked up an appetite just in time. We left the pub and walked to The Fat Duck just a few doors down the street. We were greeted at the door by name, only the second place to do so – the first being Noma – it’s such a small but nice touch and got the evening off to a great start. The restaurant is very unimposing from the outside and looks almost like one of the other houses on the street, inside it is smart but less stylish than I’d imagined. With it’s low hanging wooden beams and white walls filled with modern art pieces it feels more cosy & intimate than your usual 3 star restaurant. We were taken to our table where the Tasting Menu was explained to us and we were given a huge Harry Potter spell book style wine menu to browse. We chose to start with a glass of champagne which was excellent. 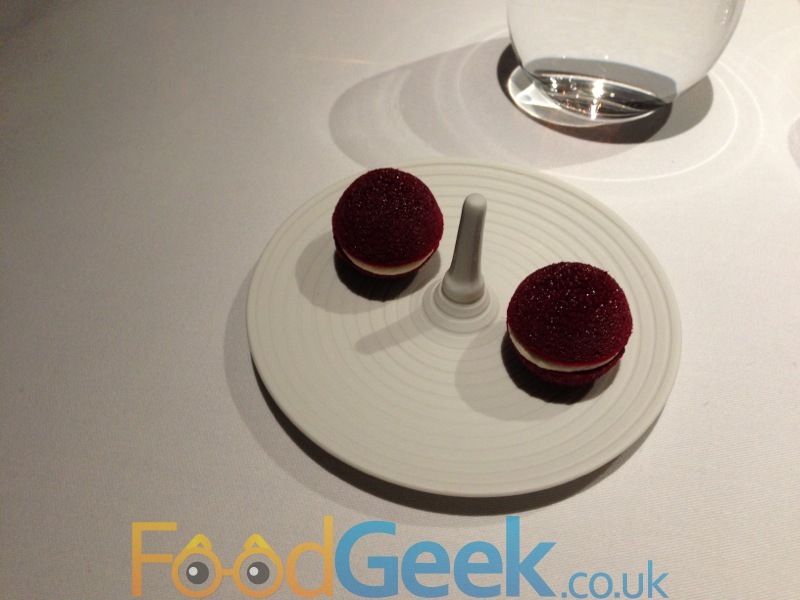 Before starting on the 14 course tasting menu we received an amuse bouche of aerated beetroot filled with horseradish cream. 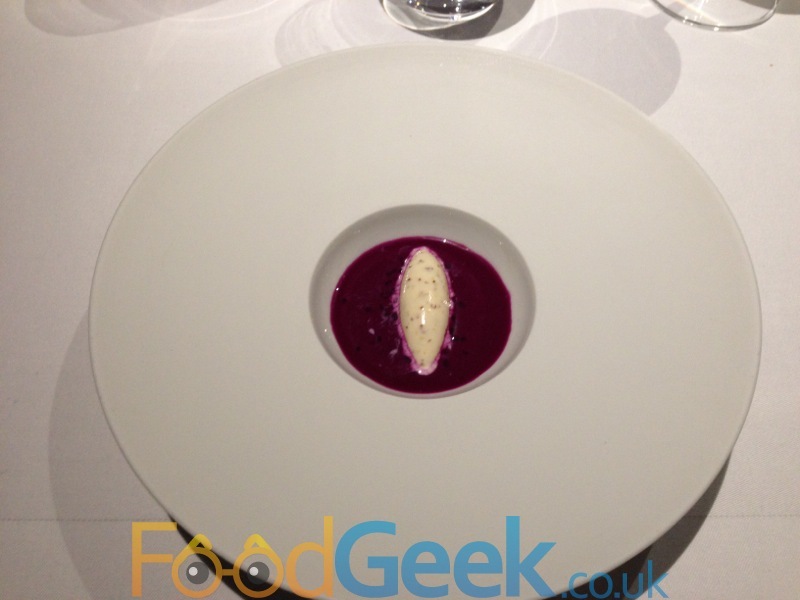 Beetroot and horseradish is a winning flavour combination and this was a great way to experience it. 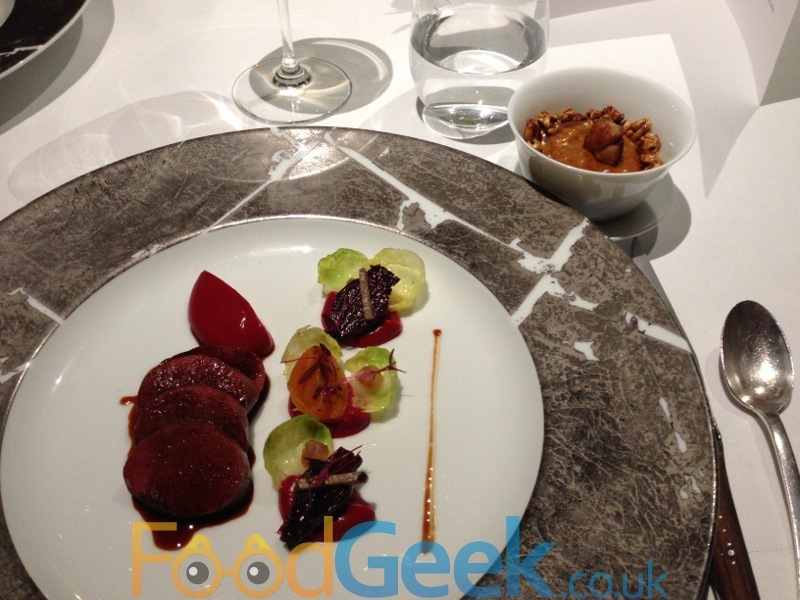 The beetroot so light and airy it almost disolved in my mouth leaving beautiful sweet & subtle flavours behind. A very good start! A waiter pushed a trolley up to our table that wouldn’t have looked out of place in a science lab. With bottles, canisters and a steaming bowl of liquid nitrogen read to prepare our next course ‘Nitro Poached Aperitifs’. We were asked to chose between Gin & Tonic, Vodka & Lime or Campari Soda. We both went for vodka & lime. 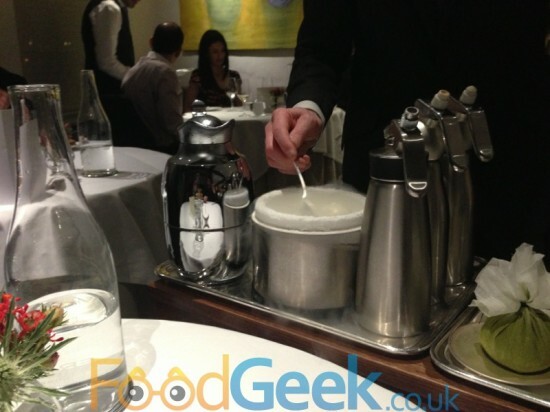 The waiter then poured a small amount of egg white mousse into the liquid nitrogen, freezing it immediately before plating it up and covering it in vodka & lime flavoured dust. The waiter then spritzed citrus flavour into the air for me to inhale as I popped the frozen aperitif into my mouth. It was initially very cold but so light that it disappeared almost instantly, leaving refreshing limey taste with a hint of the vodka flavour. A very clever palate cleanser! 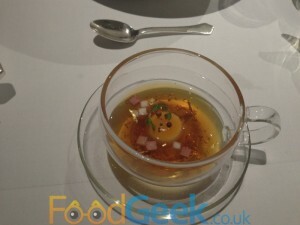 Next up was ‘Red Cabbage Gazpacho with Pommery Grain Mustard Ice Cream’. I must admit that even though I’m a fan of mustard I wasn’t particularly looking forward to tasting mustard ice cream. I should have known better, it was amazing. Very subtly flavoured, totally soft and smooth and an excellent pairing for the fresh tasting gazpacho which was packed with red cabbage flavour. I don’t know what possessed Heston to come up with this combination but it really works. We were treated to some more theatre with the next course ‘Jelly Of Quail, Crayfish Cream, Chicken Liver Parfait, Oak Moss and Truffle Toast’. First the waiter explained that truffles are naturally found around oak moss and that this dish attempts to recreate their natural environment. 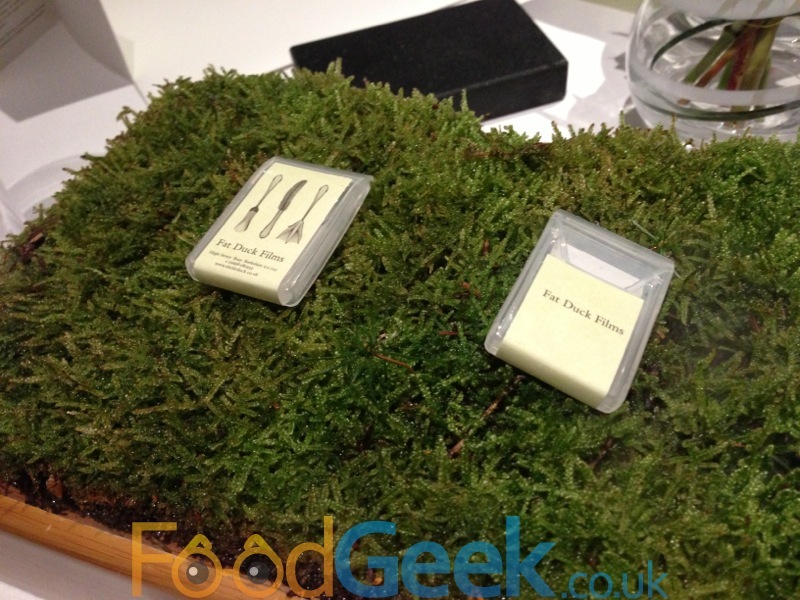 A bed of Oak moss was placed in the centre of the table which contained little packets that looked like they contained some sort of memory card. 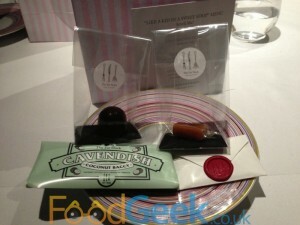 They said ‘Fat Duck Films’ on the label and contained a strip of film which we were asked to put on our tongues. Doing so filled my mouth with a subtle and delicate woody flavour. The waiter then poured water into the oak moss which began steaming and eventually covered the whole table with an eery fog and gave an enchanted forest vibe. It also gave off an aroma of moss and oak and (almost) transported me to a forest setting. This was all very well but the whole point of the dish was a small piece of truffle toast and a bowl with layers of jelly of quail, crayfish cream, chicken liver parfait & pea puree. We were advised whilst eating to try and get all of the layers in one spoonful which wasn’t easy but was certainly worthwhile, the flavour combination was simply stunning. I did try tasting them all individually too and they were all brilliant, particularly the chicken liver parfait which was so smooth. The truffle toast was a delight too. I’ve no idea if the added theatre and aromas of the forest actually made this taste better but it was great fun, an amazing dish to watch and eat. ‘Snail Porridge’ is probably The Fat Duck’s most famous dish and probably the one I was most looking forward too. It didn’t disappoint. It looked beautiful in the bowl with it’s vivid green colour – which came from copious amounts of parsley – offset by bright shaved fennel. Eating it was a joy, the thick, creamy and buttery porridge was seasoned well and very savoury from the Iberico ham and parsley, it was rich but the fennel countered that perfectly. It was just delicious and that’s without even mentioning the snails which were excellent, plump, juicy and perfectly cooked they added a meatiness to a brilliant dish. 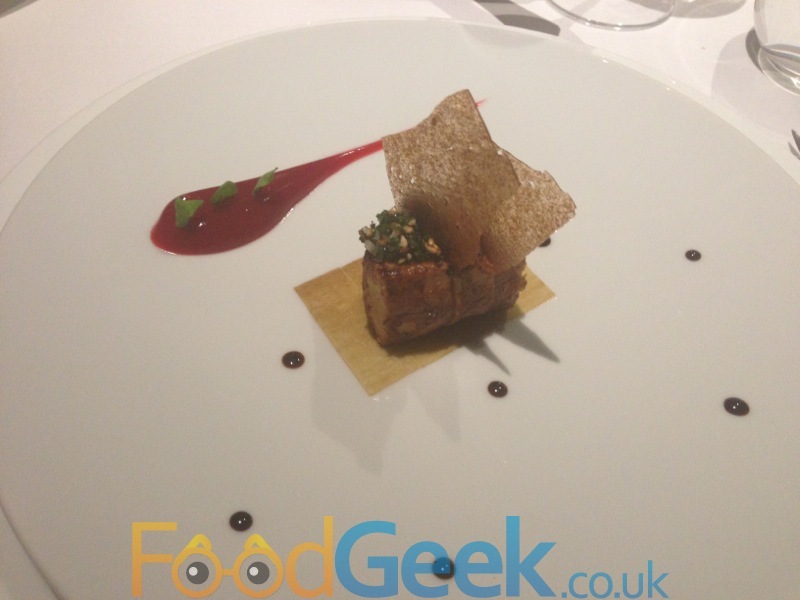 ‘Roast Foie Gras, Barberry, Braised Kombu and Crab Biscuit’ was next. I don’t eat foie gras very often for moral reasons but I am hypocritical enough to accept it when served in special places like this. The last time I ate it was in a Gordon Ramsay restaurant 4 or 5 years ago and that was exceptional but this was something else. By far the lightest and most delicate piece of foie gras I’ve ever tasted and combined beautifully with some wonderful Japanese flavours and textures from the umami rich Kombu and crab biscuit. The barberry sauce was a little too sweet for my taste on it’s own but combined with the other elements created a taste sensation. 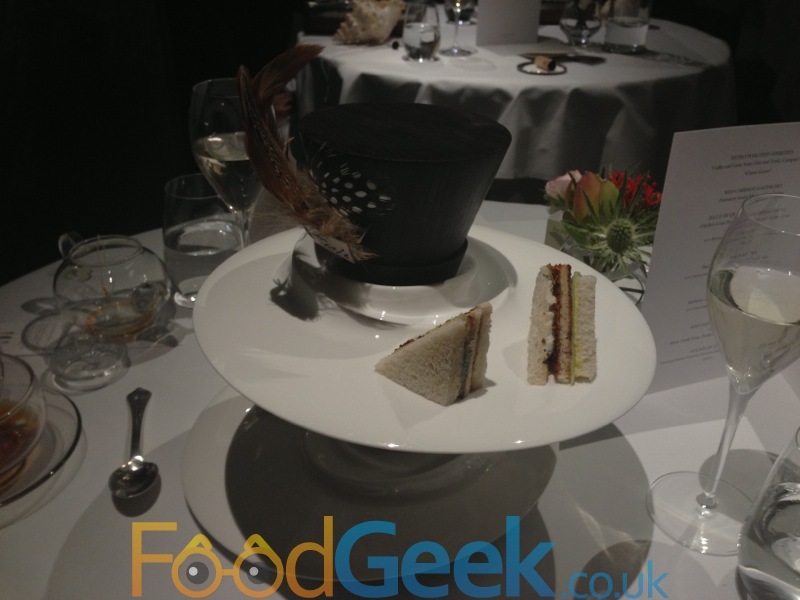 Another legendary Fat Duck dish was next, ‘The Mad Hatters Tea Party’ consisting of ‘Mock Turtle Soup, Pocket Watch and Toast Sandwich’ it’s inspired by the story of the March Hare in Alice In Wonderland. We were presented with an empty teapot and a tea cup containing the cutest food I have ever seen, tiny little cubes of meat and cucumber around a mock turtle egg (made from turnip mousse with gel on top for the yolk) with the smallest mushrooms poking out of it to look like mini toadstools. Also placed in the centre was an afternoon tea type sandwich/cake stand containing toast sandwiches. Two waiters then approached the table, one with a jewellery box containing two gold pocket watches. 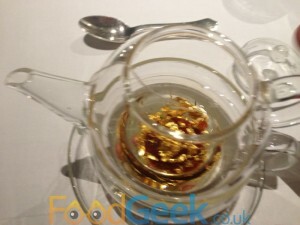 The other recited some of the story to us whilst placing a gold watch each into our empty teapots, he then added water and invited us to swirl the teapot around and we watched the golden pocket watch dissolves and turn into a shimmery beef consomme. 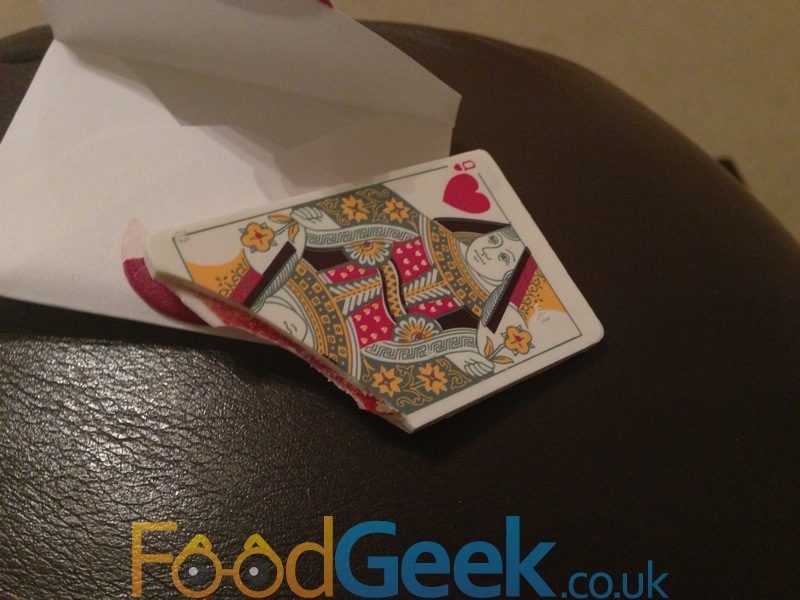 We then poured this into the tea cup over the other elements and could finally eat it! Perhaps the theatre and spectacle overwhelmed me slightly but this was probably the weakest dish of the night in terms of pure flavour. 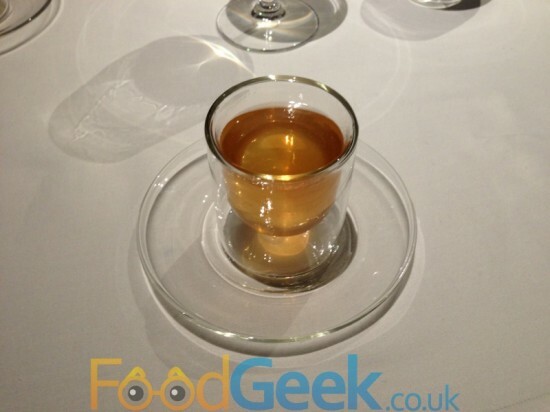 There was nothing wrong with it, it was a nice beef consomme but the other flavours didn’t add much to it, probably the only dish that didn’t taste as good as it looked or live up to the hype and way it’s presented. It was still a very enjoyable experience though. The toast sandwiches were interesting too, real toast in between slices of regular bread was actually a really nice texture, I may try that at home although I don’t often have truffle shavings on my sandwiches so it might not be quite the same. We were then served a sea shell that had grown headphone wires! 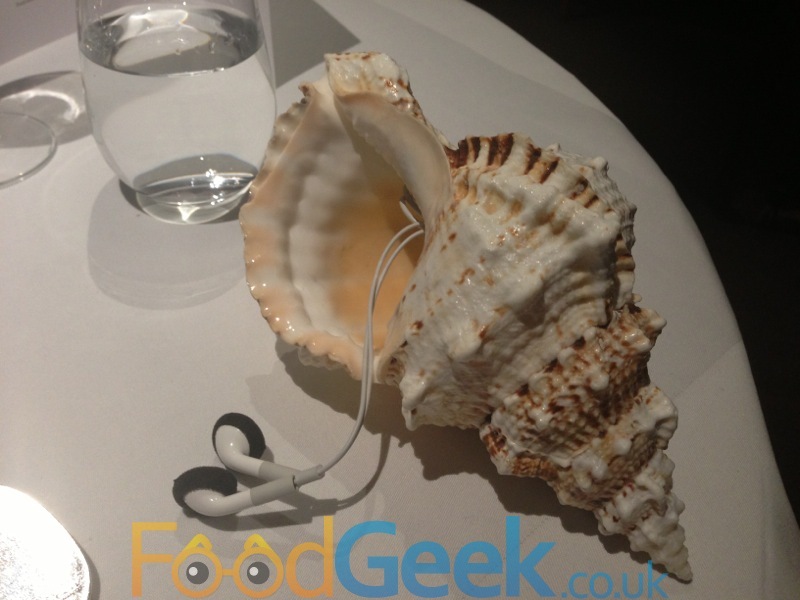 Time for another Fat Duck classic ‘Sounds Of The Sea’. Through the headphones we heard lapping waves, seagulls and other ocean noises and in front of us we were presented with a beach scene. 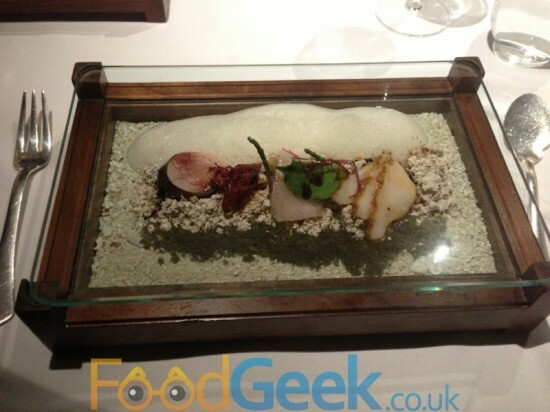 It looked beautiful and was one of the most intriguing dishes to eat, the sand was made from tapioca and fried sardines and was delicious, the sashimi of tuna, mackerel and a white fish which I think was halibut was exceptional quality. There was samphire poking through the sand to look like seaweed and a delicately flavoured sea foam. A clever dish in every way, visually stunning, amazing taste and a creative use of sound that really seemed to enhance the flavours and experience. 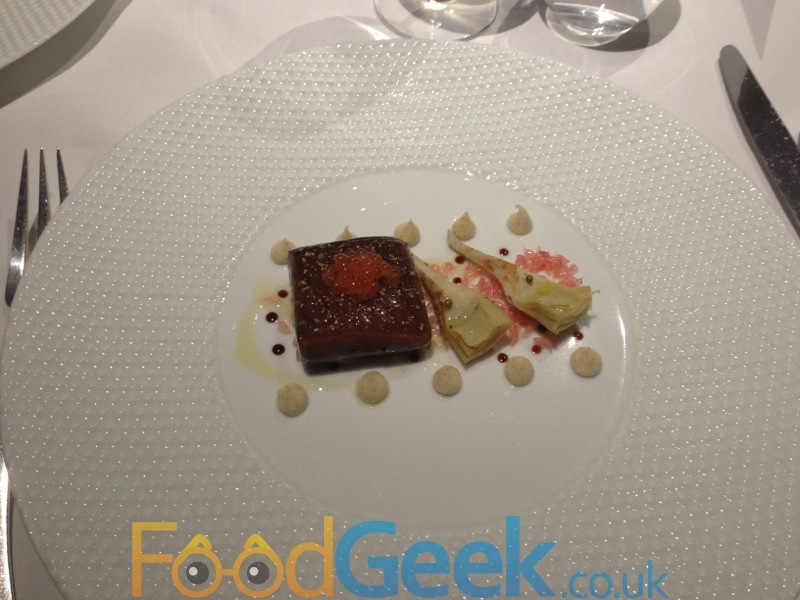 Another fish dish followed, ‘Salmon Poached In A Liquorice Gel, Artichokes, Vanilla Mayonnaise and Golden Trout Roe’. This was another dish I wasn’t particularly looking forward to as I don’t really like liquorice or fish roe and am not a big fan of vanilla in savoury dishes. However, yet again I was proven well and truly wrong. The salmon was cooked to perfection, I was very pleased to find that the liquorice was a delicate background flavour and even the trout roe was delicious. I often find it too fishy and really overpowering but this had been marinated in something which had reduced the flavour slightly and it definitely helped. Even the vanilla mayonaise was enjoyable, if a little too sweet for my taste but that was cleverly balanced with individual cells of sharp pink grapefruit (I really wouldn’t like to be on grapefruit celling duty!). 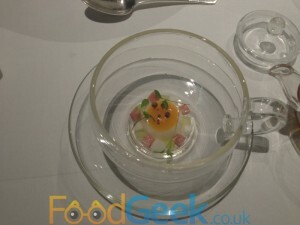 Overall it was a clever and very interesting dish that I would never have ordered from an A La Carte menu but really enjoyed. The meat course was ‘Saddle Of Venison, Beetroot Soubise, Risotto of Spelt and Umbles’. The venison was tasty and ridiculously tender, proper ‘melt in your mouth’ stuff that was almost certainly cooked sous-vide. It was accompanied on the plate by pickled baby beetroot pieces, a beetroot sauce and mini sprout leaves. The star of this dish though was the risotto on the side which was just fantastic. ‘Umbles’ comes from a medieval dish called umble pie, which was a pie filled with chopped parts of a deer – the heart, liver, lungs and kidneys. I don’t think the risotto contained any lungs of liver but there was delicious cubes of braised venison shoulder and heart which made the rich, creamy, flavour packed risotto even better. It was topped with candied puffed spelt which tasted like the most amazing sugar puffs. And that was the last of our savoury dishes. To prepare us for the 4 sweet courses to come we had a palate cleansing and sensory messing drink of tea. ‘Hot And Iced Tea’ to be precise which is technically two different brews of Earl Grey tea in the same glass which are cleverly altered so they don’t mix together. One side is hot and the other side ice cold, as you drink you can very much feel the hot tea and the cold tea as two distinct entities which is a really odd and very nice sensation. It also tasted really good too! When I saw the menu I have to admit I was a little upset about the first dessert as i’d been expecting Heston’s famous ‘Taffety Tart’ and it had been replaced with something that I not only hadn’t heard of but can’t even pronounce. However all bad feeling went away when I was presented with an exquisite looking plate of food. I also found out that it had only been on the menu for a few weeks so was quite pleased at being one of the first to try it too. The dish ‘Botrytis Cinerea’ could have been called ‘textures of grape’ as it was essentially grapes in lots of different ways. It was stunning, each and every element was a delight. There was sweet, sour, crunchy bits and even popping candy. There was edible snow and golden spirals that looked too good to eat. 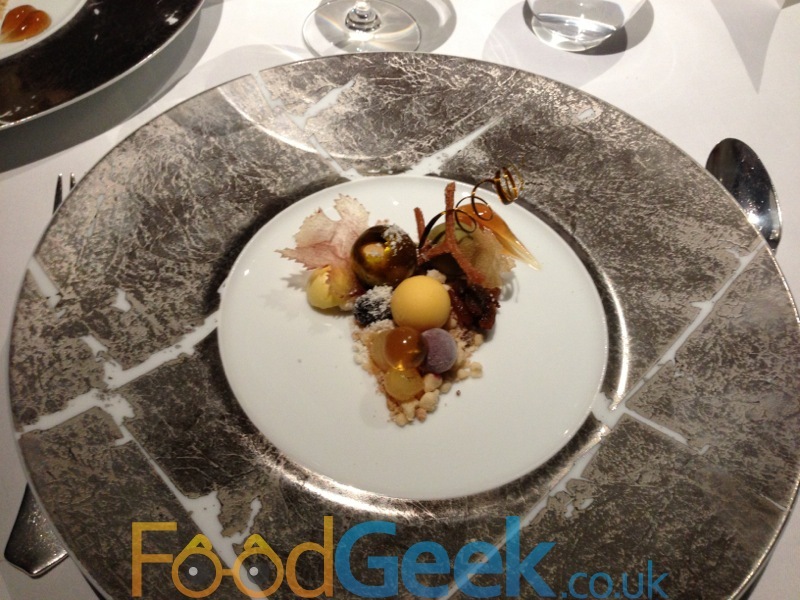 It was a slightly bonkers plateful of amazing tastes, textures and sensations. Genius and delicious. 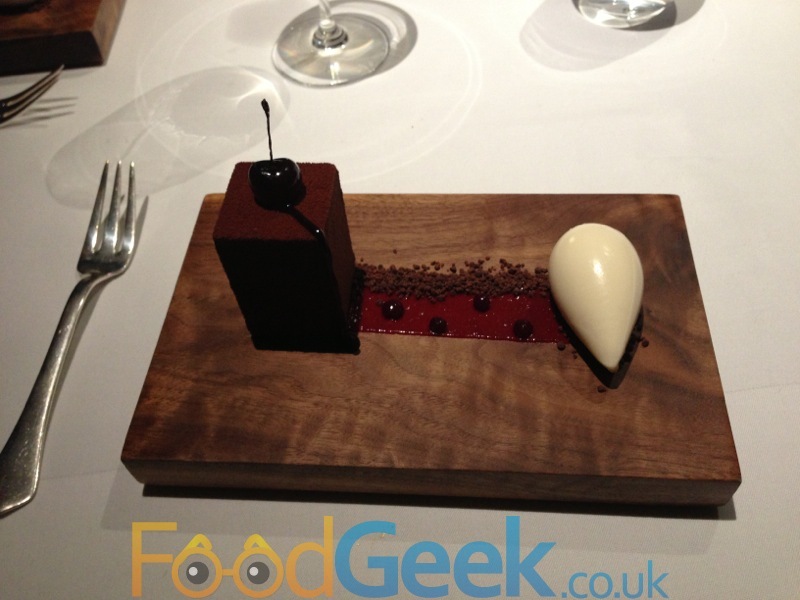 Another classic Heston dish was next, ‘The BFG’ or Black Forest Gateau that was featured on Heston’s ‘In Search Of Perfection’ TV show so I know how much time and effort he has invested into it. It’s such a classy looking dish, the precise rectangle of gateau with it’s symmetrical lines and sharp corners and perfectly even coating of chocolate was a thing of beauty as was the most perfectly formed teardrop shaped quenelle of Kirsch ice cream. Just before we got started the waiter sprayed around the table with ‘the smell of the black forest’ or Kirsch perfume. Slicing into the gateau revealed the many individual layers including aerated chocolate, gorgeous moist chocolate cake, sweet and sour cherries, a rich chocolate ganache and kirsch flavoured cream. On top was a boozy Kirsch-soaked cherry. Despite being ridiculously full by this point this was still a stunning dessert, an absolute masterpiece. We were almost done now and as much as we didn’t want the amazing night to ever end it was a good thing as we were in serious danger of exploding if we ate much more. We were presented with a map of Scotland with 4 bottles of Whiskey hanging from it and a 5th, Jack Daniels in up in Tennessee. 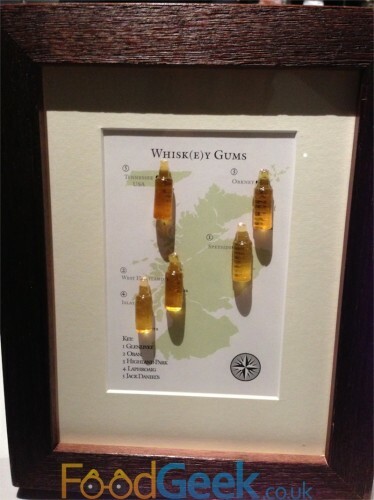 These were Heston’s take on Wine Gums but of course made from Whiskey, the map contained a key which listed the order in which they should be eaten, from the weakest to the strongest flavour. I’m not really a whisky lover and was too full to enjoy these properly but I could appreciate how well made they were and that they did each taste different. I’m sure a whisky expert would have been able to make out the individual whisky flavours used. One more course to go…. impossible. I couldn’t eat another thing. 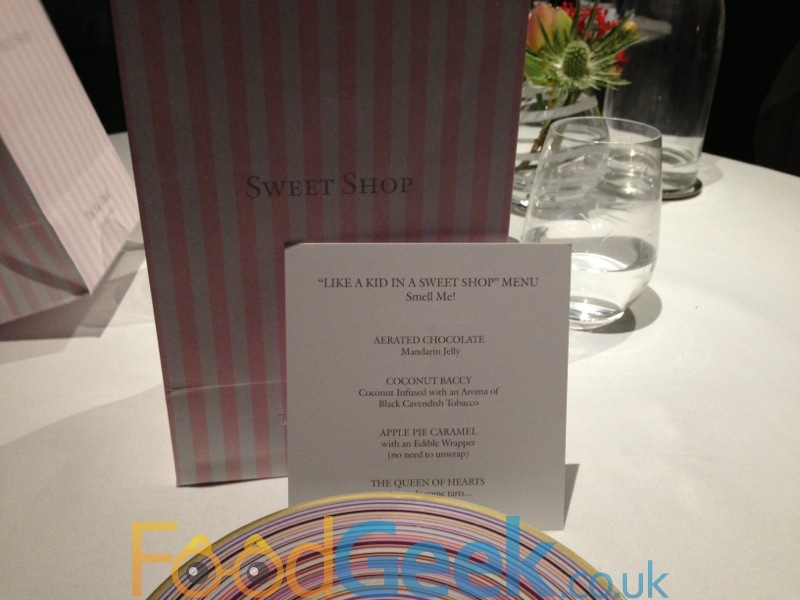 Luckily the final course isn’t really a course, ‘Kid In A Sweetshop’ is a bag of handmade sweets and goodies to take home. Phew! We had a quick peek but didn’t dare open anything as even the smell of more food might have finished us off. The next day we opened it up and found ‘Coconut Baccy’ which looked and smelt like tobacco but was actually candied coconut shreds and despite having a hint of tobacco flavour tasted pretty good. ‘Apple Pie Caramel’ (with edible wrapper) which was sweet, sticky and chewy and really tasted like apple pie. Not having to unwrap it was good fun too. An ‘Aerated Chocolate With Mandarin Jelly’ which was good airy chocolate with sweet mandarin jelly but by far the best was ‘The Queen Of Hearts’ an edible playing card that looked almost too good to eat. I’m glad I did as it tasted amazing. 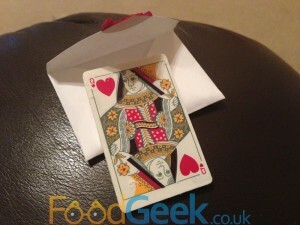 The card itself was made from the best white chocolate i’ve ever tasted (I don’t usually like white chocolate but this was gorgeous) which was printed on and inside was the most delicious fruity jam. A fitting end to the best meal of my life. In fact, I can’t even call it a meal, it was so much more than that, it’s theatre, a journey, an experience. Not only did every dish taste good, they looked good and stimulated the other senses like no other restaurant i’ve ever been too. It was simply mind blowing. It wasn’t just the food and experience either, service was impecable too, there are so many staff but they run like clockwork, they’re friendly and genuinely interested in making sure the diners are enjoying themselves and are the most knowledgeable about the menu and food being served that i’ve ever come across. Yes it is expensive, very expensive. However, I honestly think it’s good value for money when you consider not only how much you are actually getting but also the amount of work that must go into each and every dish. For me the only negative point is that as much as I would love to go again I almost certainly won’t. Not because of the cost as I genuinely believe that it is worth every single penny. It’s because I don’t think most of the dishes would have the same magic the second time around and unfortunately they don’t seem very keen to innovate and develop new dishes. In the 6 years i’ve been looking at the menu only a small number of dishes have changed, whilst i’m glad because i’ve been able to taste some of the classic dishes it does mean I won’t have any reason to go back anytime soon which is a massive shame. 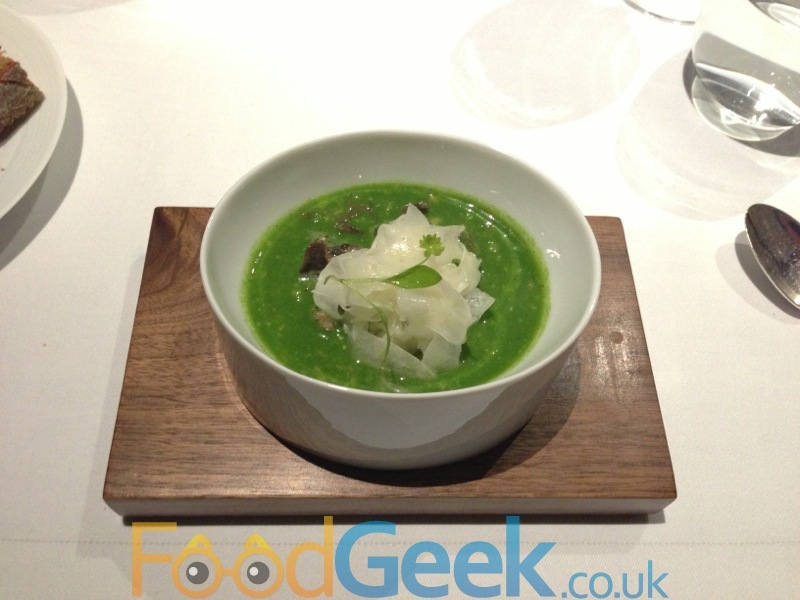 Previous: The Hand & Flowers, Marlow – Fine Dining or Gastropub? Like you, I’ve been once and won’t be back. Not because it wasn’t amazing (it was, best meal ever to date), but because I’d be really worried that eating largely the same dishes again, but lacking the magic of surprise, would maybe even tarnish the first experience. Anyway, at £600-odd quid for two people to eat and drink, I’m not willing to find out! We went in March ’11 and had precisely the same meal as you, except for lamb instead of venison and a strawberry dish instead of the grape one. Thing is, if, on the occasion of our meal, they hadn’t served the “classics”, it might have been slightly disappointing. Wonder what it’s like for the chefs, serving up the same dishes, night after night… The Fat Duck is now an interesting dilemma of a restaurant. I completely agree. It’s definitely a dilemma for them, or perhaps it isn’t since it’s still very difficult to get a reservation and the publicity from Masterchef last night will only fuel that. Whilst they’re still fully booked months in advance with no waiting list they have no reason to develop a new menu. It could possibly even backfire for them if people turn up expecting the classics and don’t get them. Amazing food of legend “but” its almost identical to a tee on the one i ate 2 years previously. 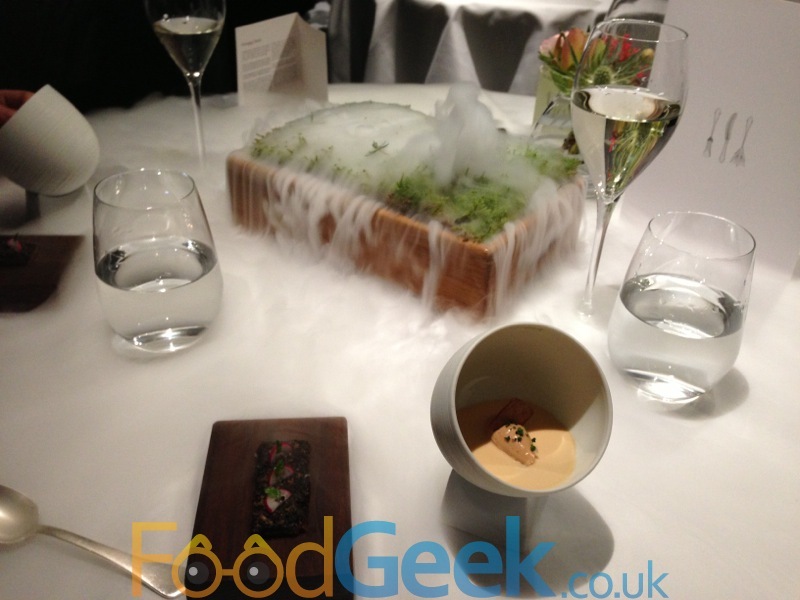 I would love to go back but that will never happen simply down to the fact that i dont want to be paying so much money for an tasting menu that ive already experienced….its simply a production line now. Thanks for your comment. I tend to agree with you from a personal point of view, it’s very unlikely that I would return and pay such huge prices for essentially the same menu. Although, I can understand it from their point of view as there are clearly either still people who haven’t eaten there or many people do return time and time again as it’s still hard to get a table and is always full despite the price going up regularly. I also think that it’s hard finding the balance of keeping the menu fresh and interesting for new people whilst keeping the ‘classics’ for first timers. I know for a fact that I would have been disappointed had I not been able to try Snail Porridge, Mad Hatters Tea Party, Kid In A Sweetshop etc.. so I can understand why they’re still on the menu. It is a shame that it probably means I won’t return though. There is a glimmer of hope though as the dessert Botrytis Cinerea is brand new and is fabulous!